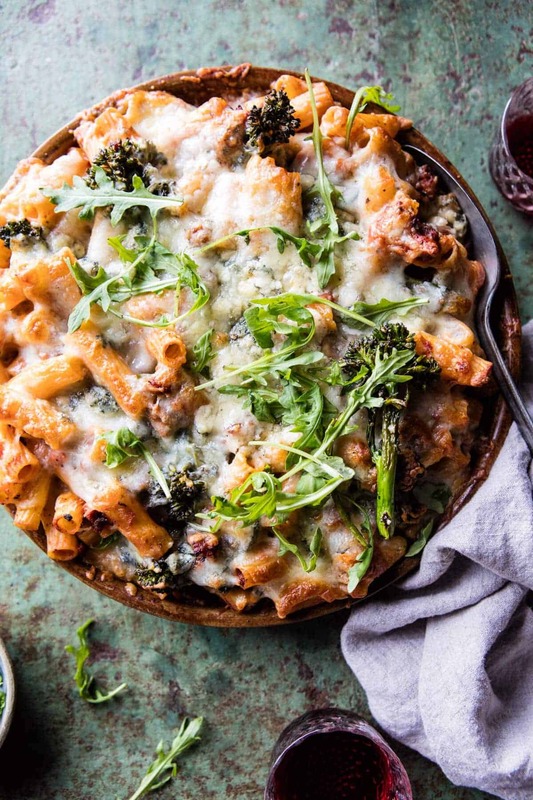 Who agrees that Sunday pasta bakes are a must? Typically around here Sunday night dinner is a little more chill than most other nights, so if all the family is around it’s the perfect night to sit down with everyone and eat a delicious dinner. Oddly, today is one of those Sundays. All of the family is in town after a busy weekend, so I am really excited to be making this bake, because it’s the perfect meal to please everyone. As you guys may know, I have some seriously picky eaters in my family and it’s hard to come up with a meal that everyone will enjoy. 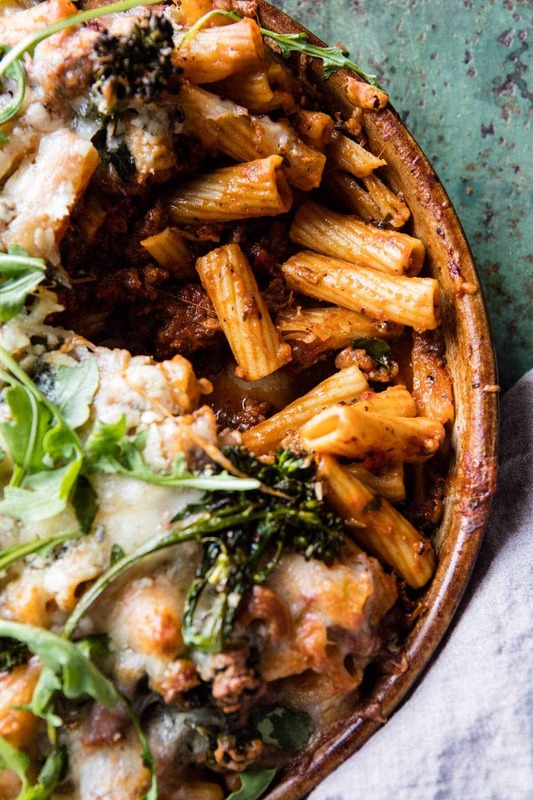 If there’s one type of recipe that’s always a safe bet, it’s a baked pasta, especially baked pasta with spicy Italian meat sauce and lots of cheese on top…aka lasagna the easy way…aka a Gerard family favorite! One of my favorite things to do on a Sunday is to have some kind of red sauce simmering on the stove. I don’t know what it is, but for some reason it just epitomizes Sunday to me. I love the smells, the warmth the stove gives off (seriously)…and the all-around comfort it brings to the house. Not to mention the delicious dinner it’s going to make. 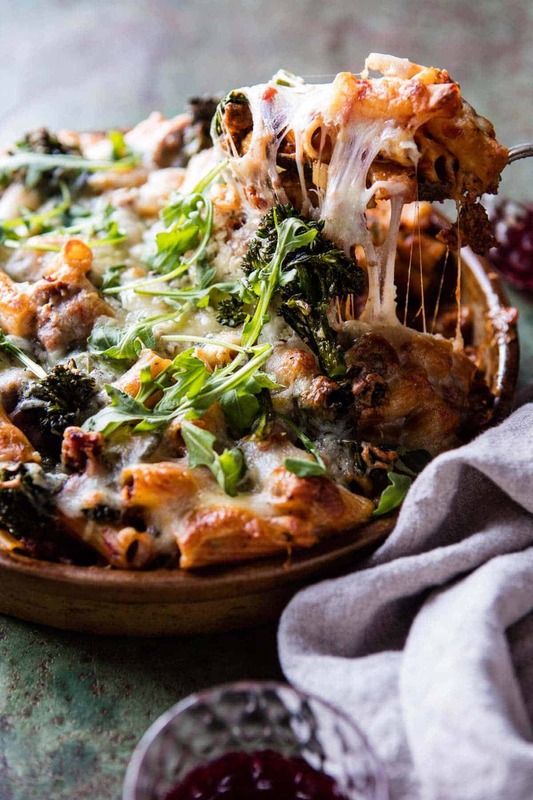 When I do any kind of pasta bake, I always love to sneak in some kind of vegetable. Not gonna lie, my family can be seriously tricky when it comes to sneaking in veggies, especially those of the green kind. When I first started cooking, I would get really sneaky and puree vegetables like pumpkin and butternut squash, but within the last year the fam has started expanding their palates and trying some new veggies. Meaning, I can sometimes get away with using green food in my recipes. YES, finally they are learning! I still have to be cautious with exactly what kind of vegetables I use and how they are prepared. They are still not fans of raw veggies, in any way, but roasted is OK. 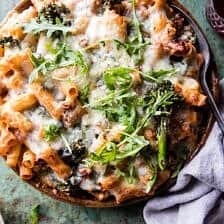 So for this pasta bake I roasted up some broccoli rabe and mixed it in with all the yummy sauce and pasta. I was curious to see what everyone would think of the roasted broccoli rabe, but you know? 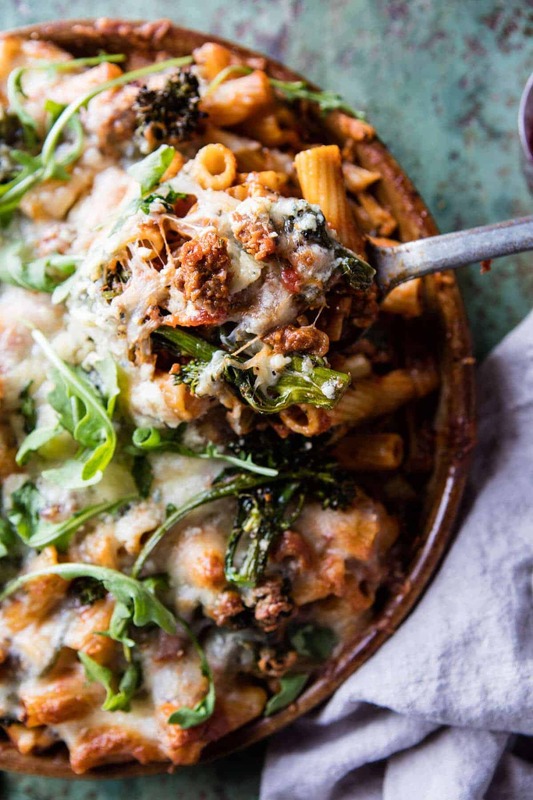 They loved it, and everyone agreed that this pasta bake is delicious…veggies and all. So here’s how this recipe works. 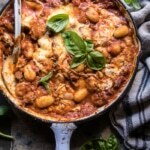 Start out by making the sauce, which is just like a classic lasagna sauce, but can be made a little quicker if you’re short on time. If you do have time though, simmer the sauce all day long and then throw everything together before serving. 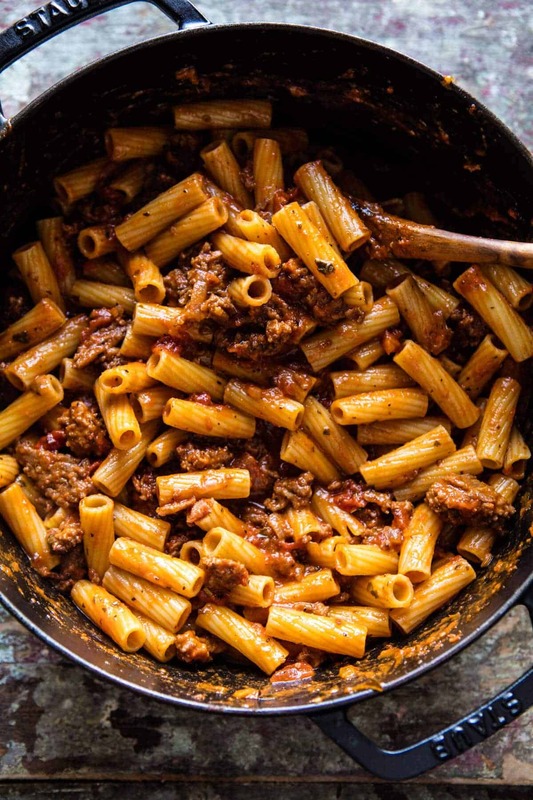 If you’d like to make this ahead, you can assemble the pasta dish in advance and then bake right before serving. So really, you can make this recipe work whether you’re short on time, need to plan in advance, or have all day to let it cook. Gotta love a versatile recipe! This is one of my new go-to’s, it’s easy to make and everyone loves it! 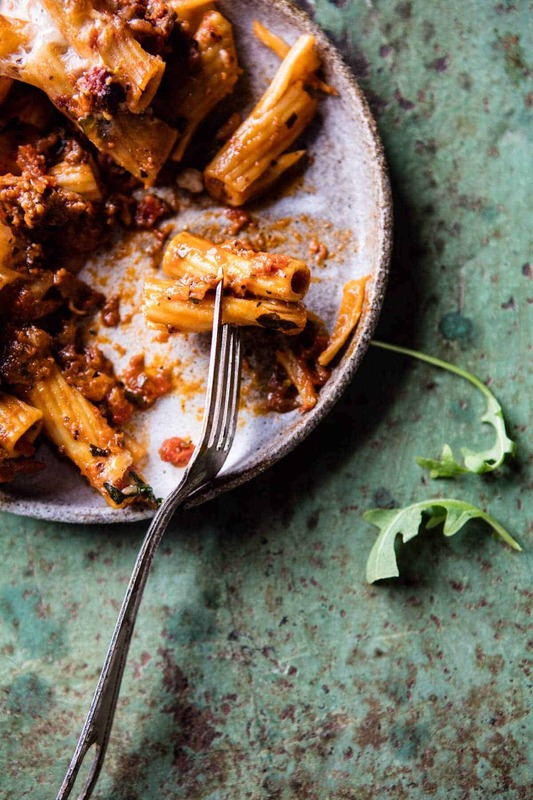 Excited to see what my oldest brother, who is not normally in town, thinks of this dish…he’s a huge fan of Italian, so I’m thinking he’s going to love it! Oh, and super important…a side of garlic bread! Because I mean, it’s Sunday and we all just need a little carby comfort food! Yes, please! 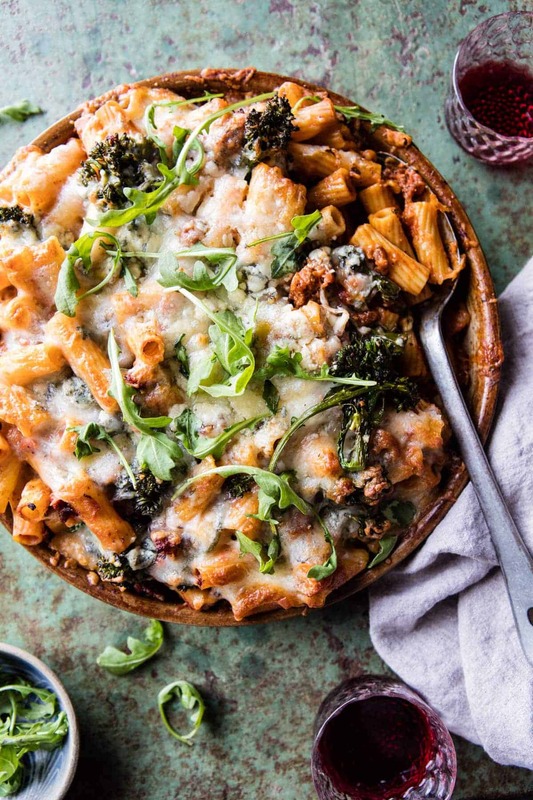 A comforting pasta bake that's easy to make and a real crowd pleaser! 1/2 cup crumbled blue or goat cheese or your favorite! Place the broccoli rabe on a large, rimmed baking sheet and toss with the olive oil, salt, and pepper. Roast until the broccoli rabe is roasted + crisp, about 10-15 minutes or until the broccoli rabe is tender crisp. Remove from the oven. Meanwhile, make the sauce. In a heavy bottomed pot, cook the pancetta over medium heat, stirring until the pancetta is lightly browned, about 5 minutes. Add the onion, garlic and red pepper. Cook, stirring until the veggies are softened, about 5 minutes. Push the veggies off to the side of the pan and increase the heat to medium-high. Add 1 tablespoon of olive oil to the center of the pan and crumble in the ground sausage. Cook without stirring for 3 minutes and then begin breaking up the meat. Continue to cook, stirring occasionally, until well browned, about 5 minutes. Add the oregano, basil, and thyme. Cook another minute or so. Add the tomatoes, sun-dried tomatoes, milk, wine, bay leaves, and a good pinch of salt + pepper to the pot. Cook the sauce over medium heat, stirring occasionally, until thickened, about 30 minutes. Discard the bay leaves, taste to season with salt and pepper. Remove from the heat. Bring a large pot of salted water to a boil. 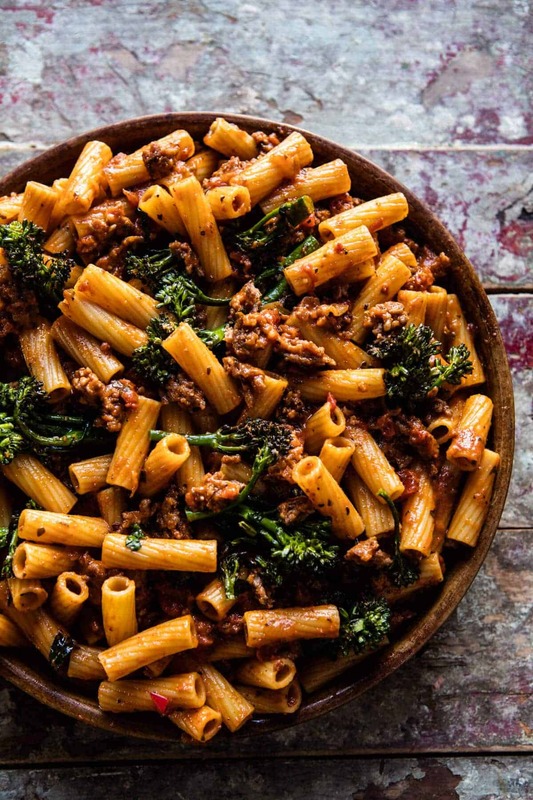 Boil the pasta until al dente, drain and toss with the tomato sauce + roasted broccoli rabe. Transfer the pasta to a 9x13 inch baking dish. Top with Gorgonzola and mozzarella cheese. Bake for 25-30 minutes or until the cheese is melted and gooey. Remove and let sit 5 minutes. Serve. Ah yes so perfect for the cold, thanks Karlie! When do you add the pasta? Yes please, a little Sunday comfort food sounds just perfect. Love this cozy bake! Yes, the perfect Sunday comfort food Tieghan. Best shared with family. I feel cozy just looking at this, love it! 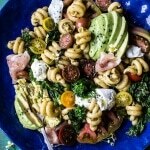 LOVE how hearty this is with the sausage and pancetta! Ah yes! They are so good! Thanks Jen! 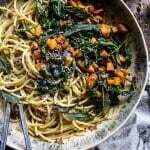 Sunday was always pasta day as a kid and broccoli rabe was a staple on our (Italian) table too, now I’m craving both! Channeled your inner childhood! Haha how funny! Hope you get to make them! I cannot wait to try this! This looks incredible! 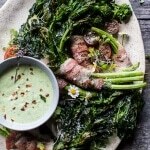 We can get broccoli rabe at our local farmers market at a great price and we love it. We are always looking for different ways to make it. Thank you for another winner. This made enough for me to eat leftovers for several days. Thats awesome! So happy you liked it Mark. Thanks you! I am SO happy you love this Calle! This is so awesome, thank you so much!! I just made this for dinner this week-holy cow! The amount of flavor this dish packs is mouth watering. Definitely will be making this again. Thanks for another great recipe! Thank you so much Melissa! I am so glad you loved this! Hi! When do you suggest adding back the veggie/pancetta mixture?